As far as we’re concerned, frozen fingers aren’t an option for kids when enjoying a day on the mountain. Quality time on a snowboard or a pair of skis is a great way for kids to pass the time this winter, and we want to make sure nothing gets in the way of maximizing that time so every kid can improve his snowboarding or skiing skills. At Quiksilver, we design kids snow gloves and kids ski gloves that can protect against the coldest of temperatures so that the weather never gets in the way of a good day on the mountain. 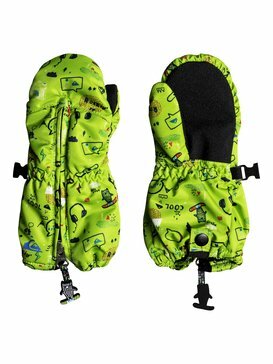 Kids gloves are one of the most important accessories kids can wear while skiing and snowboarding because hands are often one of the first body parts to feel the harsh effects of the winter air. We’ve been designing high quality snowboarding accessories for so long that we have perfected the art of combining comfortable design with superior warmth to create the best kids snow gloves available which is why every kid should trust Quiksilver as the best brand for kids gloves each winter. 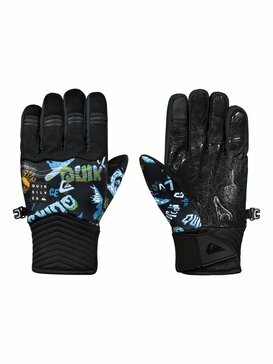 The best way for kids to keep their hands protected on the mountain this winter is to put them in a pair of kids ski gloves or snowboarding gloves from Quiksilver. 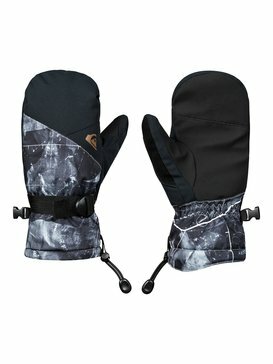 The cold air is not the only element our kids snow gloves and snowboard mittens are designed to protect against. Since kids are spending the day interacting with the snow, we make sure to design kids waterproof ski gloves so that the moisture from the snow doesn’t leave them with frozen wet fingers half way through the day. Kids waterproof gloves are extremely important because as they are learning, kids will surely be getting their hands dirty in the snow during the day and their gloves should be able to protect against that. 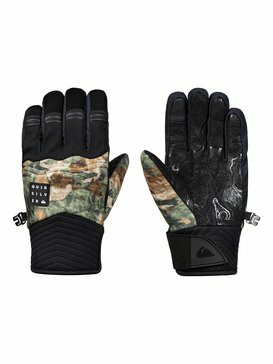 Another feature that makes Quiksilver kids gloves the best kids ski gloves to choose from is that they offer full protection for young snowboarders and skiers. What do we mean by that? Snowboarding and skiing can be difficult to master and the learning curve often comes with a stumble or two so our snowboard gloves with wrist guards are up to the challenge to keep kids hands and wrists fully protected against the risks that come with enjoying a day on the mountain. Whether it’s from the weather or the natural risk of the learning curve, Quiksilver ski gloves for kids keep kids hands protected. 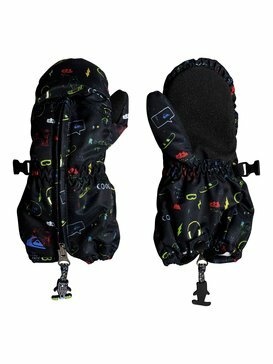 Quiksilver enjoys designing snow gloves for kids each season because we know that they will make such a big difference in the comfort of each kid while on the mountain. During the winter, kids wear kids winter gloves even if they’re not on the mountain just to keep their hands warm while they’re enjoying time outside or playing in the snow with friends. Our kids snow gloves and ski gloves take the level of warmth and comfort one step further because we know that days spent on the mountain can be long and we want our ski gloves for kids to be able to endure as much quality snowboarding and skiing time as is desired. 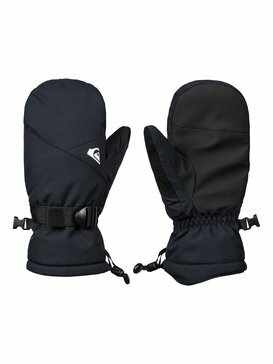 Quiksilver kid gloves and kids mittens are made with quality materials that are soft and warm while also being capable of protecting against moisture from the snow. Everything that a kid could want in a pair of kids ski gloves comes standard with every pair of Quiksilver kids gloves, and we’ve even thrown in some additional details to ensure that there is no room for discomfort this winter season. 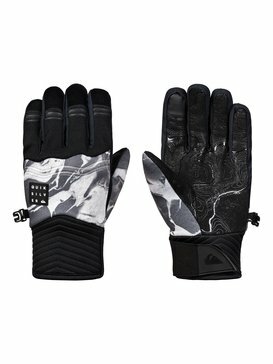 Winter is here and there is no better time to stock up on quality kids snow gloves and kids ski gloves than right now. Quiksilver’s online store offers a convenient online shopping platform that makes it simple to browse the full collection of kids gloves and buy the styles that are the right fit. Our free customer service help line is available via live chat, email, or phone, to answer any questions that arise, so you’re shopping experience can be easy and enjoyable.